The eyes of the tennis world are set on London SW19 this week with the start of Wimbledon, the most prestigious Grand Slam of the world. There is one man, born in our stunning destination Split in today’s Croatia, who holds a special record related to The Championships in Wimbledon. Goran Ivanisevic is the only person to win the men's singles title at Wimbledon having been handed a wild-card entry by the organizing Lawn Tennis Club. After three lost Wimbledon finals in 1992, ‘94 and ’98, he was just recovering from an injury in 2001 and ranked 125th in the world. Without even hoping for a comeback, he was going to be the best ever tennis player never having won a Grand Slam title. Against all odds, he eventually made it to the finals and won. 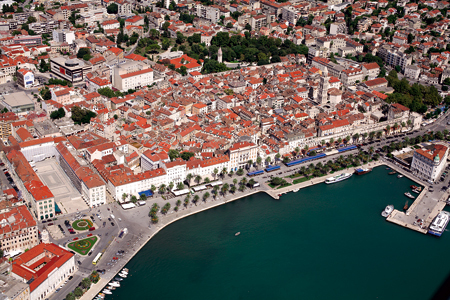 Aerial view of Split - Goran Ivanisevic's home town. For another interesting Balkan fact, Ivanisevic was interested in football as well, he used to play in gala matches for Hajduk Split and in the national team of Croatia too. Experience the breathtaking beauty of Dalmatia with one of our package holidays to Split or why not take things one step further and come on board one of our adriatic cruises departing from Split.